Sean Murdoch believes the watching Paul Hartley will spur Falkirk on in today’s derby – but insists depleted Dunfermline still have enough to come out on top in the Irn-Bru Cup clash. 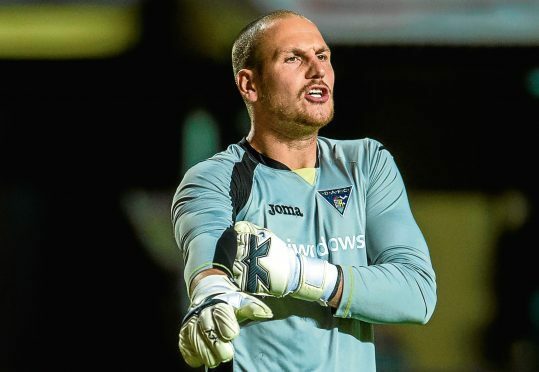 The Pars keeper accepts the Bairns are likely to have been boosted by the appointment of Hartley as successor to Peter Houston this week. In contrast, Dunfermline travel over the Forth having suffered a disheartening defeat to title rivals Dundee United last weekend and with skipper Callum Morris, full-back Ryan Williamson, winger Fraser Aird and striker Callum Smith all on international duty. But Murdoch is confident the East End Park men, who stormed to a comprehensive 3-1 win when the sides met in the Championship in August, can cope with the absences as they bid to land a quarter-final berth. With Hartley to take over on Monday after Alex Smith takes charge for one last time this afternoon, Murdoch said: “Their new manager might not be in charge but he’s going to be watching and I’m sure they’ll all want to impress in his first game to keep their place and play. “They’ll definitely be up for it, but we will as well. “It’s a derby and it doesn’t matter what competition it is, we want to win the competition. We’ll be going out to win the game, that’s for sure. “The last game was a good day for us and they’ll probably look back upon that and think they were pretty poor and we beat them quite comfortably. Despite key absences, Dunfermline were keen to play today’s game rather than explore the possibility of a postponement with the SPFL. And Murdoch has backed that decision, insisting the Pars have a strong enough pool of players to cope with the trip to the Falkirk Stadium. He added: “We’re short on numbers but we’ve got a good squad and one that’s capable of winning the game. “It will give people who maybe haven’t played much a chance to shine and stake a claim for future weeks. “There was no reason to call the game off. We’ve got players waiting in the wings who are very good footballers.